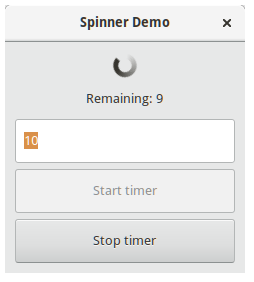 The Gtk.Spinner displays an icon-size spinning animation. It is often used as an alternative to a GtkProgressBar for displaying indefinite activity, instead of actual progress. To start the animation, use Gtk.Spinner.start(), to stop it use Gtk.Spinner.stop(). An extended example that uses a timeout function to start and stop the spinning animation. The on_timeout() function is called at regular intervals until it returns False, at which point the timeout is automatically destroyed and the function will not be called again.
""" Handles "clicked" event of buttonStart. """ """ Handles "clicked" event of buttonStop. """ """ Handles destroy event of main window. """ Return True to stop it. is recalculated based on the current time.""" """ Start the timer. """ """ Stop the timer. """